This information is available only for professionals. To view it, please log in or register. Acidum silicicum D20, Aesculus hippocastanum D12, Arnica montana D6, Arsenum iodatum D20, Aspidosperma quebracho-blanco D2, Aurum metallicum D20, Graphites D12, Kalium iodatum D8, Lobaria pulmonaria D4, Strychnos nux-vomica D20. REGENAPLEX No. 24c is a homeopathic medicinal product used within the homeopathic tradition for the symptomatic relief of asthma. If you have been prescribed other medication, ask your healthcare professionalif you can take REGENAPLEX No. 24c at the same time. When should REGENAPLEX No. 24c not be used, or only with precaution? Respiratory problems need to be checked by a physician. To prevent asthma symptoms, drugs are applied according to scientifically based guidelines which inhibit the continuous inflammation of the airways. The anti-inflammatory drugs have to be used permanently in asthma in most patients and may even when using a homeopathic preparation not be discontinued, since it can lead to irreversible damage otherwise. Do not use REGENAPLEX No. 24c without medical advice in case of thyroid disease, nor to be used in children under twelve without prescription by physician. REGENAPLEX Nr. 24c drops should not be applied on children up to 6 years of age. Inform your healthcare professional or pharmacist if you suffer from any other disease(s), have allergies or if you take any other medication (including non-prescribed medicines). 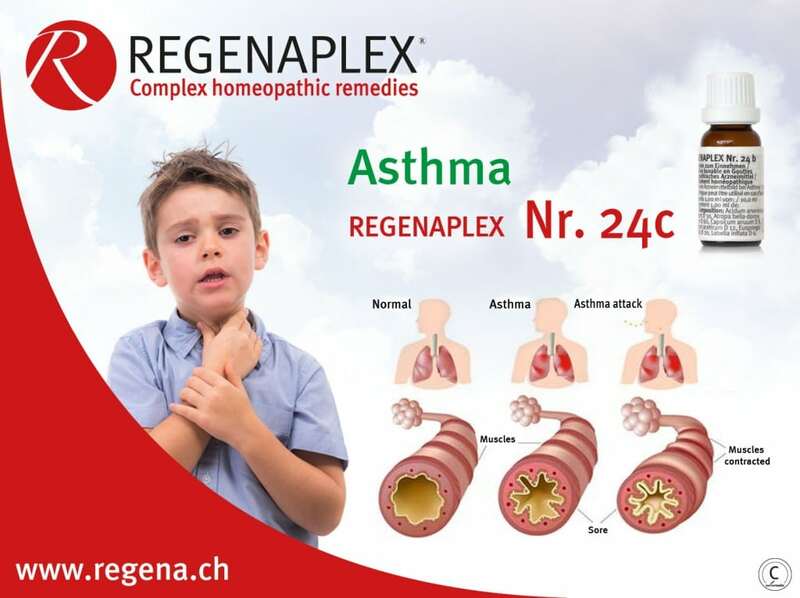 Can REGENAPLEX No.24c be used during pregnancy or breastfeeding? Based on the strength of experience, no risk to the child is known if used appropriately. However, no systematic, scientific studies are available. To be on the safe side, however, you should avoid or use as little medicine as possible during pregnancy and breastfeeding, or you should ask your healthcare professional for advice. Dosage and administration of REGENAPLEX No. 24c. Administration: Administer drops orally, or dilute with a bit of water beforehand. Keep drops on tongue for about one minute before swallowing. Do not drink, nor eat 15 minutes before and after application. If you feel, that the remedy’s effect is too strong or too weak, speak to your healthcare professional or pharmacist. Are there any known side effects to REGENAPLEX No. 24c? No side effects are known for REGENAPLEX No. 24c, when used appropriately. If you notice a side effect, inform your healthcare professional or pharmacist. When using homeopathic remedies, symptoms may initially worsen (preliminary worsening). If worsening continues, stop using REGENAPLEX No. 24c and inform your healthcare professional or pharmacist. Store drops at room temperature (15–25° C). Drops contain 50 % vol alcohol. Where can REGENAPLEX Nr. 24c be bought? What package sizes are available? In all pharmacies without medical prescription. This package insert was last approved by Swissmedic in November 2011.